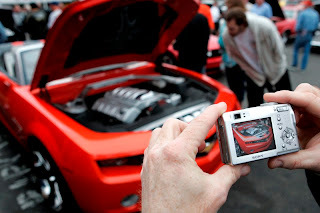 The top ten car stories of 2011 on Hover Motor Co.
2011 was a pretty good year for our little blog. I wrote 196 stories, and we picked up hundreds of thousands of page views. While the majority of the readers here are predictably from Kansas and Missouri, we had hundreds, usually thousands, of readers from all 50 states, and several more from countries all around the world. It's easy to forget just how many people actually have access to this place. They don't call it the World Wide Web for nothin'! Naturally, some stories did better than others. For example, I have a real passion for model car stories, so I spend a great deal of time setting up pictures and making fancy slideshows for them. But in spite of all the effort, they rarely get much reaction from readers. I like them, though, and since I'm the one writing all the stories, I'll probably continue to do them as long as I keep the lights on here. Finally—a story that my mom can appreciate! A couple of weeks ago, I wrote an article on the history of the Volkswagen Beetle. 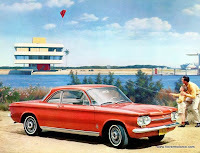 What you may not realize is that Chevrolet built a car to compete head-to-head with the popular German compact. 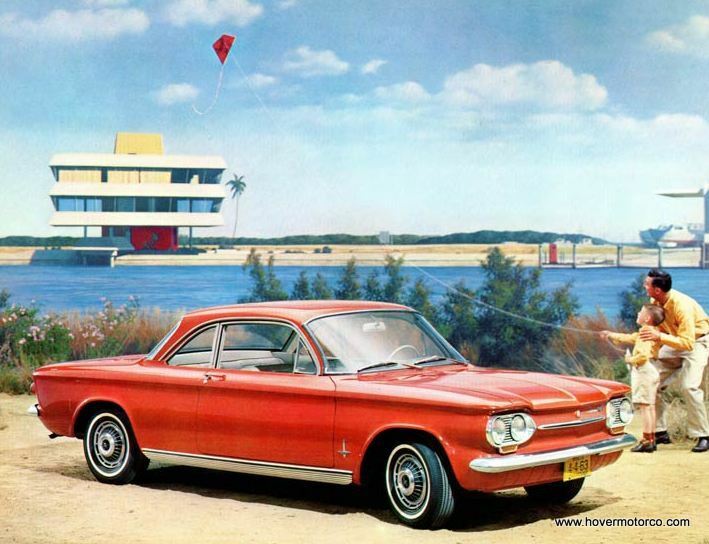 And while you might not think about it in the same way as the Beetle, Chevrolet’s Corvair was one of the most innovative, advanced cars of its time. I was recently reading an article about the legendary Peterson Publishing photographer Eric Rickman in an issue of Hot Rod Deluxe. It talked about how he had to be somewhat selective when he clicked the shutter, because it was obviously not as easy or cheap to take as many photos as you wanted back in the days before digital cameras. Of course now, when I go to a car show, I can take 1,000 pictures at a time if I want with no penalty whatsoever. And that’s a good thing, because admittedly, I am not a very good photographer. Virtually every picture I take on here was captured by my little, red Sony Cyber-Shot point-and shoot. None of them are going to win any contests. Some of them are just flat-out blurry. The hot rodding hobby is a respected facet of American culture, but it wasn’t always that way. If you read articles, or even watch movies from the 1940s through the early ‘50s, anyone who owned a fast car was depicted as a hooligan set on destroying all that was good and pure in the world. Legend has it, these scofflaws were racing through city streets in unsafe, cobbled together death heaps, mowing down innocent people, and destroying the lives of every teenage boy and their unlucky girlfriends who were along for the ride. It’s a special day for a special member of the Hover Motor Company blog. As regular readers may know, my son BHo regularly attends car events with me, and often contributes photos for the stories. We are celebrating his eighth birthday, and I wanted to brag on him for a minute. BHo’s birthday is obviously close to Christmas, so the influx of presents can be pretty overwhelming. We had a birthday party for him two years ago, and my wife suggested that he ask his friends for canned goods and food instead of gifts. He then donated the food to the St. Vincent De Paul Food Pantry at our church, and we let him go to the store and pick out one present for himself. He collected 140 food items from his friends and family that year. The unmistakable smells of ether and gasoline fill the air. A turn of the key. A crank of a wrench. Another turn of the key; then a sputter. Followed by silence. Once more—a plume of smoke, and that distinct, air-cooled rasp wheezes to life. And if the driver is lucky enough to get out of his parking space without the engine dying again, the reward is a white-knuckled drive at a maximum speed of 42-mph. Such is the life of a vintage VW owner. And you know what? They love every bit of it. Last month, I went to the SEMA show. Now as you probably know, that is one of the biggest gear head gatherings in the world, as nearly 2,000 wild automotive creations converge on Sin City. That being said, car-for-car, I actually enjoyed looking at the selection in Bartle Hall over the weekend better than the cars at SEMA. The annual Mecum Muscle Cars and More Grand Finale took place in Kansas City this weekend, and some 750 vehicles packed into the big climate-controlled convention center downtown. For old car fans, December can be a bleak time in Kansas City. The car shows are over. The race tracks are silent. The weather is starting to become cruising-prohibitive. The party, as they say, is over. But then, Mecum Auctions brings in their annual Grand Finale event, and suddenly things aren't that bad after all.